What's a piezo ratchet motor? Get your protogami today. This is a really useful design tool. In a perfect motion system, the controller would send a signal and the hardware would deliver the load to the position commanded. In reality, error sources like backlash and mechanical hysteresis compromise performance. OEMs want to focus on their product's unique value proposition, not on matching gear teeth and damping vibration. Now a pair of innovative components from MICROMO makes it easy to get the performance they need with minimal effort and cost. 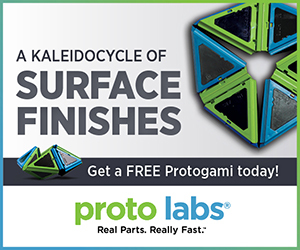 Soon you may be trading the latest sports scores, celebrity gossip, or work updates around the 'ole office 3D printer instead of the water cooler if Stratasys has its way. The company's newest release of 3D printers for plastics gets the technology one step closer to ubiquity in creative design spaces. 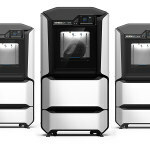 The F123 Series of three 3D printers is aimed at professional rapid prototyping, from initial concept verification to design validation to functional performance testing. Sweetspots include easy office usability, precision, repeatability, and affordability. And did we mention they look great too? When programmers at Martin Aerospace in Lanark, Scotland, started to experience difficulties with their computer-aided manufacturing (CAM) software using new, more advanced machine tools, they turned to ESPRIT CAM software for all of their programming needs. The software’s simulation capabilities enabled them to closely examine programs in search of improvements, which eventually led to reduced cycle times between 20% and 30% on most parts, substantially improving the firm's competitive position. 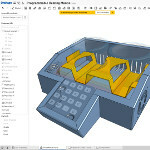 Onshape is the only professional 3D CAD system to offer sheet metal designers and manufacturers simultaneous and synchronized flat, folded, and tabular views. 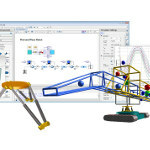 The software is just about to release a new set of powerful cloud-based design tools that will enable CAD users to visualize errors and interferences immediately, consider alternatives, and reduce scrap and wasted time. For example, if you pick bends in the wrong place, it will show you why the flat pattern won't work or why it is not optimal. Fabricators can also adjust the model based on specific tooling, without violating the design intent. Now that is how you do it. 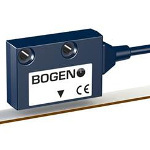 BOGEN has introduced a more compact version of its magnetic measuring head IKS9. In addition to an 11-mm-wide body, IKS9 is now available in a 9-mm width to be used in the most confined spaces, providing the highest accuracy for magnetic measurements with freely selectable resolutions. The IKS9 impresses customers in automation, instrumentation, and motion control applications with its extremely high accuracy and a particularly high degree of modularity. Distributed in the USA by Electromate. J.W. Winco now offers GN 303 (with Steel Components) and GN 303.1 (with Stainless Steel Components) Zinc Die Cast Adjustable Levers with Push Button, Threaded Stud Type. The adjustable hand levers, which are RoHS compliant, have proven to be ideal wherever parts have to be clamped in a confined space or in a particular lever position. The insert is connected to the lever via serrations that can easily be disengaged. Pulling the lever upwards disengages the serrations, allowing it to be swiveled to the ideal clamping position. When releasing the lever, the serrations automatically re-engage. The releasing button is a unique design element and allows for effortless release action. 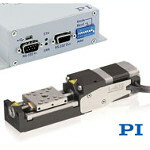 The L-402 compact linear stage from PI (Physik Instrumente) is well suited for micromanipulation, test systems, and opto-mechanical alignment automation applications. With a travel range of 1/2 in. (13 mm) and velocity to 0.2 in./sec (5 mm/sec), the L-402 delivers high accuracy and smooth motion for loads up to 1 lb with minimum incremental motion and repeatability down to 0.5 microns. Long service life and excellent guiding accuracy with minimum backlash are guaranteed by creep-free crossed roller bearings. The stage comes with the choice of two direct-drive motors, a DC servo motor with closed-loop encoder and 2-phase stepper motor. Other encoder options for OEMs are also available. The LLB130 Miniature Load Button from FUTEK has a capacity range from 1,000 g to 50 lb and is RoHS compliant. All capacities are in stock and ready to ship. 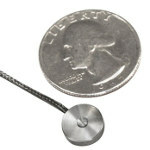 This mini load cell features low deflection and fast response time, and it is fully internally temperature compensated. Maplesoft has announced a major new release of MapleSim, an advanced system-level modeling and simulation platform. MapleSim 2016.2 contains a variety of new features, including new live simulations for increased design productivity, 3D overlay for comparing simulation visualizations, and improved revision control tools that facilitate large projects involving multiple engineers working on the same model. The new release also includes significant enhancements to toolchain connectivity, expanded analysis tools for the MapleSim Battery Library, and improved import facilities for the MapleSim CAD Toolbox. Can you handle the latest 'nightmare' robot from Boston Dynamics? An insider named "jurvetson" at a recent Boston Dynamics investor event posted a Youtube video of the company's founder, Marc Raibert, showing footage of the new Handle robot, a two-wheeled, two-legged balancing giant described (sarcastically) as a "nightmare." It takes the company's famous BigDog pack-animal creation from years back to a whole new level. Also featured was a live demo of a sprightly four-legged droid called SpotMini that impressed with its maneuverability and extra "hand" that could retrieve a beer. Watch the impressive video of the demo. Researchers working in Trinity College Dublin in Ireland have used the wonder material graphene to make the novelty children's material Silly Putty (polysilicone) conduct electricity, creating extremely sensitive sensors. This world-first research offers exciting possibilities for real-world applications in new, inexpensive devices, including diagnostics in medicine and other sectors. While most of us were beginning early preparations for the holidays last year, Bell Helicopter was letting military and industry insiders know that it is working hard to launch a new unmanned tiltrotor concept called the V-247. It will combine the vertical lift capability of a helicopter with the speed and range of a conventional fixed-wing aircraft. The company already has a new manned tiltrotor design in the works. Piezo ratchet motors are inertia motors based on the stick-slip effect. A small piezo ceramic actuator embedded in a precision mechanism drives a high-resolution screw. An optical encoder reads position changes and feeds the information back to a closed-loop controller. Resolution in the nanometer rage is feasible. This self-locking design features high holding forces compared to its compact size. Applications include opto-mechanical alignment, fiber optics, and nanopositioning. See a Physik Instrumente ratchet motor design in action.